Developed from aerospace technology, the Verabar averaging pitot flow sensor provides unsurpassed accuracy and reliability. The V500 is used on explosive, poisonous, or hazardous fluids. 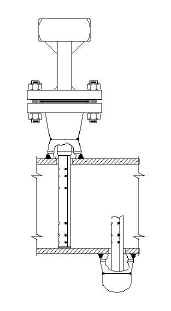 This model is used when plant regulations require flanged connections and / or for extremely high pressures and temperatures. This model is also used on extremely large pipes and ducts (greater than 6 feet). The model V510 includes opposite side support. Similar to a V500 except the sensor is spring loaded against the opposite wall of the pipe. The V550 can handle greater fluid velocities than the V500 and does not require an opposite end support. Developed from aerospace technology, the Verabar averaging pitot flow sensor provides unsurpassed accuracy and reliability. With its solid one piece construction and bullet shape, the Verabar makes flow measurement clog-free and precise. The unique sensor shape reduces drag and flow induced vibration. And the location of the low pressure ports eliminates the potential for clogging and improves signal stability. The Verabar senses the natural Averaged Pressures created by the velocity profile of the fluid. When the fluid impacts the sensor, it creates a high pressure zone, greater than the pipe static pressure, in front of the sensor. As the fluid moves past the sensor, it accelerates and a low pressure zone is created to the sides and rear of the sensor. Alternate vortices are shed as the fluid separates from the sensor and a partial vacuum is formed at the rear of the sensor. Multiple ports are positioned in the high and low pressure zones and an averaged differential pressure is produced. Veris, Inc., 6315 Monarch Park Place, Niwot, CO 80503. Tel: 303-652-8550; Fax: 303-652-8552.